Honeyrose Herbal Products, based in England, is the world leader in production of tobacco free and nicotine free herbal cigarettes. 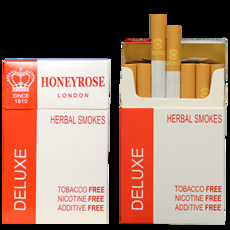 Established in 1910, Honeyrose Herbal Products, has been producing and perfecting its herbal cigarettes since the 1960's. The company's mission has been to offer smokers a tobacco free alternative to regular cigarettes. The result is a herbal cigarette which features 100% organic, wildcrafted herbs such as clover leaves, marshmallow leaves and rose petals, matured in honey and fruit juices. 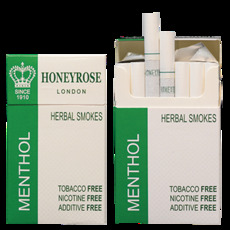 All Natural 100% Herbal Menthol Cigarettes: A specially blended herbal cigarettes with a cool, refreshing menthol taste. Guaranteed tobacco and nicotine free. Tar level of 6mg. Made in England. Must Be 18 or older to purchase. 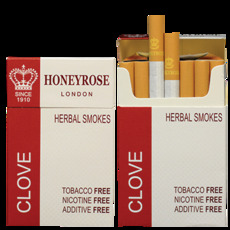 All Natural 100% Herbal Clove Cigarettes: These herbal cigarettes are bursting with spicy clove, but still offer a light taste and mild flavour. Guaranteed tobacco free and nicotine free. Tar level of 10mg. Made in England. Must Be 18 or older to purchase. All Natural 100% DELUXE Herbal Cigarettes: Packed in the unique slide' n shell packs, A fuller flavour is created by the addition of extra honey and fruit juices to Honeyrose's original herbal mix. 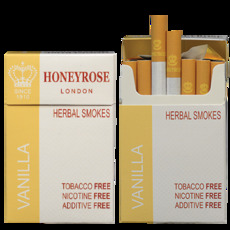 All Natural 100% Vanilla Herbal Cigarettes: Honeyrose's original blend with the addition of vanilla flavor! Tar level of 6 mg. Made In England. Must be 18 or older to purchase.